In stock -This product will ship today if ordered within the next 2 hours and 13 minutes. 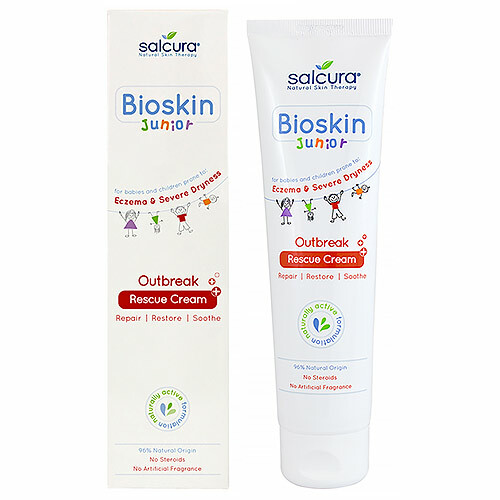 Salcura Bioskin Junior Outbreak Rescue Cream is a natural therapy for targeting flare-ups in babies and children prone to eczema and severe skin dryness. Use for occasional flare-ups to quickly to calm and soothe dry, sore skin. Unlike steroid creams, there is no limit to the number of times Outbreak Rescue Cream can be applied; its steroid-free formulation blends naturally active ingredients that work in harmony with the skin to keep it healthy and hydrated. A highly effective product for severely dry and eczema prone skin, without long-term worry. Always use in conjunction with Bioskin Junior Daily Nourishing Spray for best results. Salcura have developed the Bioskin Junior range to offer easy, natural and effective skin therapy for children and babies over 3 months. With Active therapy products to tackle eczema-prone and severely dry skin, and SKIN FRIENDLY WASH products for day-to-day care, the Bioskin Junior range is ideal for those looking for natural, gentle and chemical free skin therapy but are not prepared to compromise on quality and effectiveness! Containing no unnecessary chemicals, the ingredients are a minimum 92% natural origin. Full of vitamins, minerals and oils, it gives your baby and children healthy skin the healthy way. Aqua**, Glycerin*, Linum Usitatissimum (Linseed) Seed Oil**, Urea*, Cetearyl Alcohol*, Olea Europaea (Olive) Fruit Oil**, Zeolite (minerals)**, Cetearyl Glucoside, Borago Officinalis (Borage) Leaf Extract**, Olea Europaea (Olive) Leaf Extract**, Ricinus Communis (Castor) Seed Oil**, Simmondsia Chinensis (Jojoba) Seed Oil**, Phenoxyethanol, Sodium Cetearyl Sulfate, Ethylhexylglycerin, Caprylyl Glycol, Echium Plantagineum (Echium) Seed Oil*, Cymbopogon Martini (Palmarosa) Oil**, Lavandula Angustifolia (Lavendar) Oil**, Pelargonium Graveolens (Rose Geranium) Oil**, Rosa Damascena (Rose Flower) Flower Water**, Citronellol*, Geraniol*, Phenethyl Alcohol*, Linalool**. Apply Outbreak Rescue Cream to affected areas as required until skin condition is under control. Once the skin has returned to normal, revert to using Daily Nourishing Spray only. 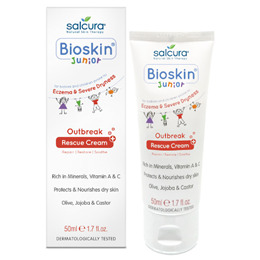 Below are reviews of Salcura Bioskin Junior Outbreak Rescue Cream - 50ml by bodykind customers. If you have tried this product we'd love to hear what you think so please leave a review. Great product - works very well on my grandaughter's sore eczema hands. I bought the small one first then bought the larger one as it is a very good product. I would highly recommend this.